vehicles and 20 landed properties in Edo, Rivers and Lagos states recouped from Michael Obasuyi Osasogie to First Bank Plc. Obasuyi admitted to N11.4bn fraud and asked for plea bargain. An announcement by the Acting Head of Media and Publicity of EFCC, Mr. Tony Orilade, said Obasuyi made false and nonexistent monies through the guide of Fundgate Financial Application. The statement said: “Trouble began for Obasuyi after a petition he wrote to the Commission against E-tranzact in March 2018. “The Commission, however, investigated Osasogie’s business interests, following the receipt of a counter-petition written by E-tranzact against Osasogie and one of his companies, SmartMicro. “SmartMicro was said to have approached E-tranzact in 2012 for the deployment of bulk purchase solution called “Corporatepay” to facilitate payment of salaries of Delta State employees in microfinance banks. “It was also alleged that e-tranzact configured an additional outbound fund transfer solution called ‘Fundgate’ in 2017, which required SmartMicro to maintain a pre-funded settlement account with First Bank Plc for settlement of account it had initiated. Obasuyi, in his statement to the EFCC, confessed to have committed the crime, stating that he created fraudulent and imaginary monies through the aid of Fundgate Financial Application from the company. Obasuyi, said to be Philosophy graduate from the University of Lagos (UNILAG) was arraigned alongside his firms — Platinum Multi-Purpose Co-operative Society, SmartMicro Systems Limited and Platinum Smart Cruise Motors Limited — on May 24, 2018 before Justice Mojisola Dada of the Special Offences Court sitting in Ikeja on a 14-count charge bordering on stealing N11, 498, 944, 038.29. During his trial, an investigator with the EFCC, Orji Chukwuma, told the court how the proceeds of crime were kept in some new generation banks. Led in evidence by the prosecution counsel, Rotimi Oyedepo, Chukwuma had told the court that “SmartMicro Systems Limited assumed a position of a fictitious microfinance bank in Nigeria through a software, Micro switch Server 1.1 created by the defendant as well as two genuine microfinance banks, which he used to carry out his fraud. The witness had told the court that when e-tranzact disconnected from the chain, all the transactions carried out by the defendant collapsed on his own account with First Bank, thereby leading to the discovery of the fraud. The sums of N2,903,727,563.92; $37,992.87 and €18,538.09 were recovered by the Commission from Osasogie’s accounts in various banks. The Commission also recovered 116 cars and 20 properties in Lagos, Abuja, Benin and Port Harcourt. The prosecution counsel had, therefore, urged the court to convict the defendant on counts one to 14, according to the law. The defendant later entered into a plea bargain. The prosecution counsel urged the court to consider the plea bargain entered into by the defendant on May 21, 2018 as judgment in his sentencing. Counsel to the first and second defendant, Osasu Ogebor, had told the court that his clients went into a plea bargain to give out what does not belong to him. “It is not enough for the accused person to say I am sorry for what he has done. But from his inner heart, he is absolutely sorry, My Lord,” Ogebor had pleaded. Lawyers to the 3rd and 4th defendants also agreed with Ogebor’s prayers. Justice Dada convicted the defendant on all the counts and sentenced him to one year imprisonment. The Judge also ordered the forfeiture of the defendant’s 116 buses, 20 properties and monies in various accounts to First Bank Plc. 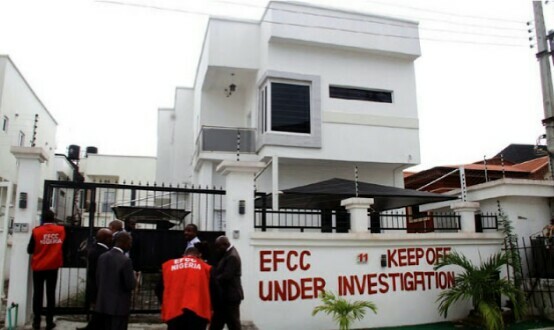 EFCC was commended for diligent prosecution of the case.